* International orders will ship rolled due to the high cost of shipping a stretched canvas. On the morning of April 18th, 1942, just four months following the devastating surprise attack on Pearl Harbor, sixteen Army Air Force B-25 bombers under the command of Lieutenant Colonel James Doolittle engaged in a daring aerial raid to strike back at the enemy�s capital of Tokyo. For his role, Doolittle was awarded the Congressional Medal of Honor. 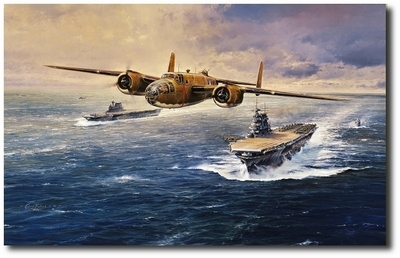 Robert Taylor�s classic masterwork was created with the technical assistance of Jimmy Doolittle himself, and portrays the moment that Doolittle flies over the carrier to check his compass bearing while another B-25 launches from the heaving deck of the Hornet. The original print edition, signed by Doolittle and thirteen of his men, is now a rarity highly sought on the secondary market. Thanks to the Gicl�e process, collectors can now complement those high value signed prints with the release of these Studio Proofs. Produced and printed onto fine canvas under the direct supervision of the artist to match his original painting, and then mounted on to high-quality stretchers, each of these carefully crafted Gicl�e Studio Proofs is fully authorized and personally hand-signed by the artist Robert Taylor. Exclusively limited to just 75 copies worldwide, each canvas Gicl�e is stamped on the back, hand-numbered and issued with a highly informative Certificate of Authenticity.